Hopefully, if you have not read "The Secret" already, you'll put it on your book list. This book aims to define the secret to life and most importantly the key to happiness. Its unconventional in its' thinking but offers a much needed concept to our lives. The idea that we control our destiny by thinking things into existence. Yes, using cognition to generate the things that we want in our lives. You're probably wondering, what I'm talking about. Basically, its' saying to yourself I want ______, and by saying it to yourself, you subconsciously work your life in a way that you bring it to you. You begin to live in a way that will allow what you want to be gained. Its' not such a hard concept to grasp if you understand basic psychology. Our subconscious affects the thoughts that we are unaware of, if your subconscious is trained to believe that you worthless, your behaviors reflect your feelings of worthlessness and you in turn feel worthless. On the other hand, if you began saying to yourself, I am a wonderful person, who is kind and loving, you behave that way and people reinforce your thinking. Now apply this concept to your life. Its' not a far fetch. Millionaires sleep, eat and dream money. They say to themselves I need to be richer, I am going to be richer and they start doing things to make their thoughts come into existence. They think money into their lives. Hey, I don't think its' such a bad concept to try. 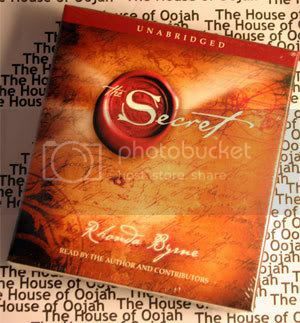 I read and watched the secret and I think everyone should read or watch it. I have my vision board! You had to be my sister! I haven't watched the DVD but I defintely will.